Viking sounds great as a monophonic instrument, but can be even more powerful as a polyphonic instrument. Since creating a PolyViking requires quite a bit of CV routing, a Combinator patch is provided here with some tips on how to use it. This example song demonstrates two sounds that rely on Distributor. One can be heard clearly at the beginning playing the chords that continue in the background. It relies on the basic polyphony that Distributor provides. Then the voices are doubled in the middle of the song to add some fatness. The second is the main lead sound. It relies on the layering capability of Distributor. Originally, there are four Vikings per voice, allowing them to play a two part harmony. At the loudest point they play in unison, resulting in 24 detuned oscillators. There is also a standalone Viking bass synth. 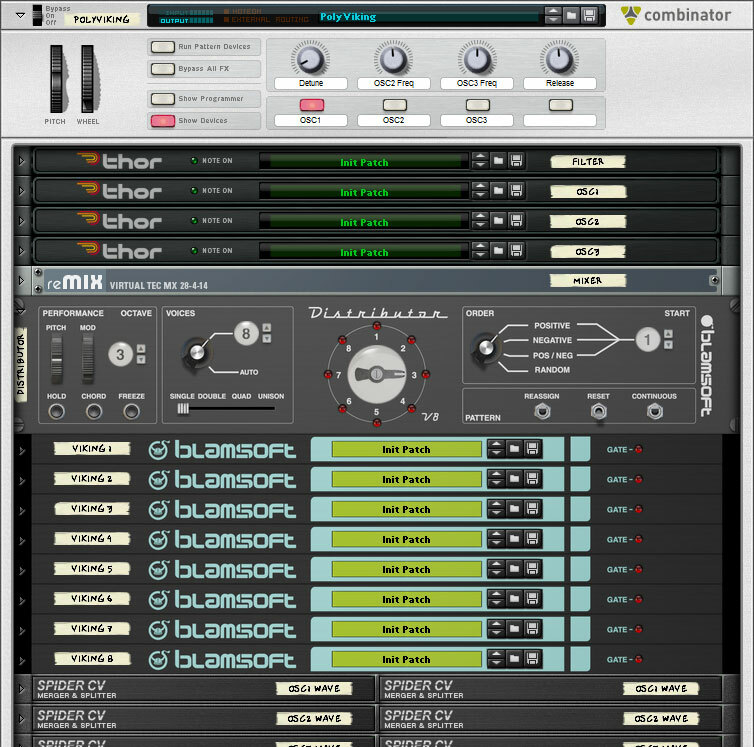 The Combinator consists of four Thors, used for their control knobs, a mixer to mix the Vikings, a Distributor that handles all of the MIDI, eight Vikings as the sound sources, plus Spider CVs for routing help. This tutorial explains how the Combinator is set up and how to use it. Starting with the controls, not all of Viking’s controls could be routed in the Combinator, but many of the common ones are available. On the Combinator panel, the Detune knob adjusts the Fine Tune knob of all of the Vikings slightly differently, adding an analog flavor to the instrument. The other knobs are mapped to every Viking equally. The frequency knobs adjust the frequency of the oscillators with respect to Oscillator 1, the Release knob controls the amplitude release, and the buttons enable the oscillators. On the Thors, there are more controls. 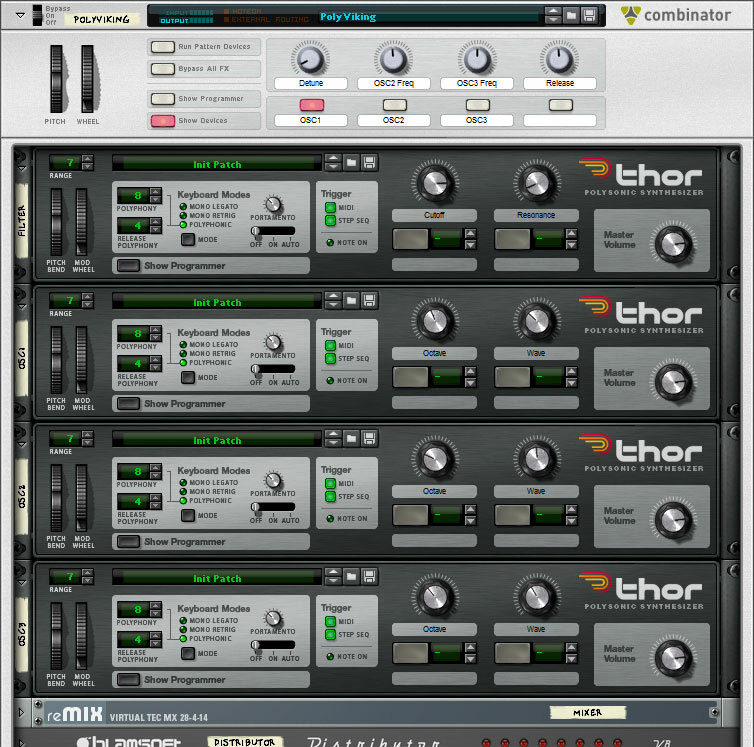 The filter cutoff and resonance are controllable on the first Thor. The next three Thors each control the Octave and Wave of their respective oscillator. Remember that the Thors are just being used as CV controllers and are not generating or processing sound. Next is the mixer. 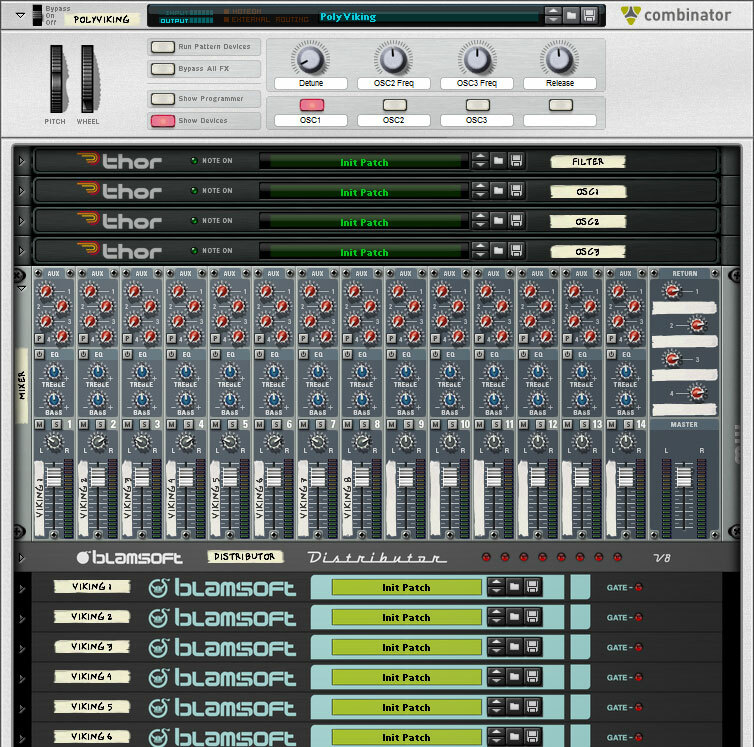 The mixer allows you to mix each of the voices. It is useful for giving each voice a different pan location. The DSI Prophet 08 synth has a pan spreading knob that adjusts the panning of the voices. 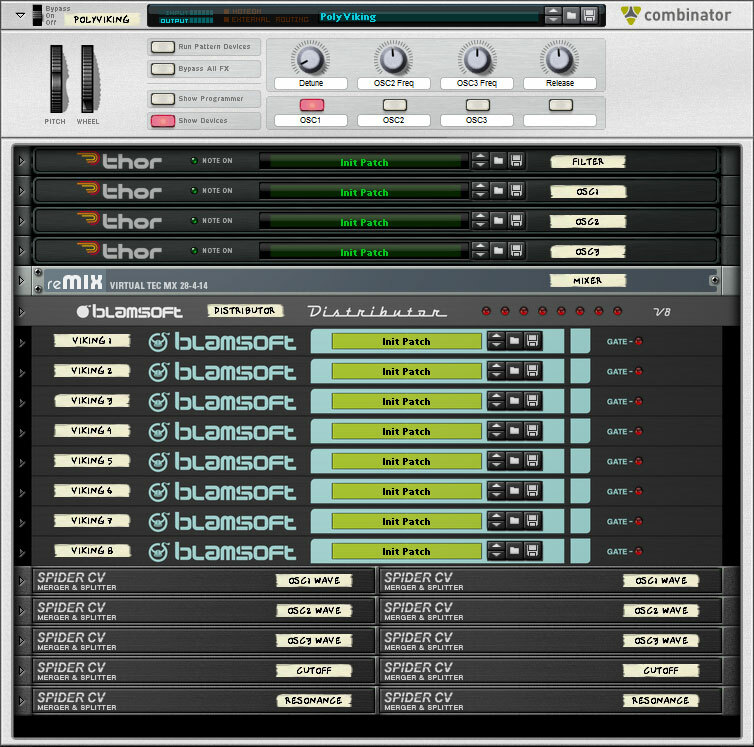 This spread feature is not available on any Reason instrument but can be done easily with Distributor. The Distributor is at the heart of the Combinator. The Combinator has been set up so that Distributor receives MIDI notes and performance input. 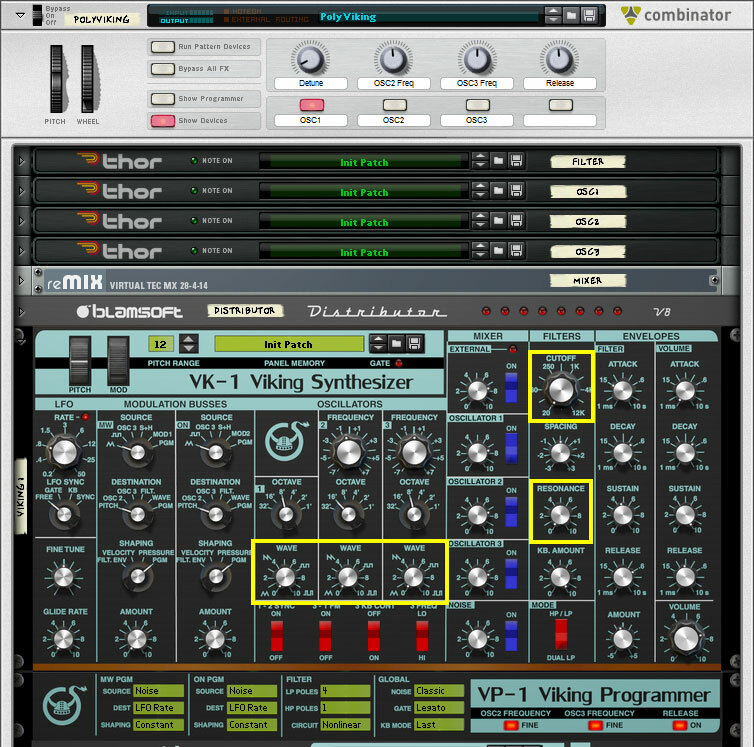 The Viking synths do not receive MIDI from the Combinator but instead are controlled by CV. The Distributor sends note, gate, pitch wheel, mod wheel, aftertouch, and sustain to the Vikings. You change the Combination slider to layer voices as was done in the example song. A few things should be mentioned about the Vikings. The filter cutoff and resonance as well as the oscillator waveshape are controlled by CV. For this to work well, the corresponding knobs need to be turned all the way down on the Vikings. After loading new patches into the Vikings those knobs will most likely need to be turned down if you want to tweak them from the main controls. Also, the amp release has been mapped in the Combinator but the other envelope settings need to be changed individually. The Combinator mappings could be changed if needed. If you want to try out a sound on a single voice, simply turn the voices settings to 1 voice on the Distributor. Then switch it to auto to use all of the voices. Now that you know the basics of the Combinator, you can customize it with your own mappings and effects. Leave comments and suggestions below. That’s a good point. Blamsoft is working on a solution for this.